Internal union elections are unlikely to capture much attention, especially at a time when media coverage of labor borders on nonexistent. But the results of a recent election in the Chicago Teachers Union should interest those who care about the future of public education, as they suggest that progressive teacher unionism in Chicago is here to stay for at least the next few years—and may spread among teachers around the country. The Caucus of Rank-and-file Educators (CORE), the group headed by Karen Lewis at the helm of the CTU that led 30,000 teachers, paraprofessionals and clinicians out on strike last September, was re-elected Friday by an overwhelming majority. Eighty percent of the union’s voting members opted for the CORE slate, with the remaining 20 percent voting for the opposition, the Coalition to Save Our Union. The election was remarkable not because of the personalities chosen to lead the union once again but for the vision of unionism Chicago teachers embraced. At a time when teachers and their unions are under attack nationally, the vote was an endorsement of the CTU’s brand of democratic, progressive teacher unionism that sees itself as a central piece of a larger movement—alongside community members and students—for educational justice. It’s a vision that has always existed among American teachers unions, but has long been a minority position. The Chicago Teachers Union leadership, now looking forward to another three years in charge of the country’s third-largest educators’ union, hopes to see that vision expand across the country in the near future. The competing groups that vied for power in the union largely mirror the choice teachers unions nationally face around whether their unions will be democratically led by members and social justice-oriented, or led by paid staff to improve teachers’ working lives alone. The opposition Coalition based their challenge on the perception of teacher dissatisfaction with worsening compensation and teaching conditions. Lewis’s caucus, they argued, spent too much time in the streets and too many resources organizing. Teachers principally want their monthly dues payments to be used to advance their self-interests, the Coalition argued, not build a movement. Given the choice between the two, Chicago’s educators overwhelmingly chose CORE’s vision. 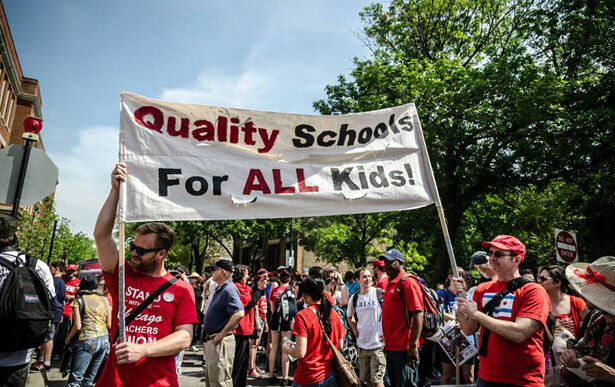 Formed in 2008 to nudge a union leadership that caucus members characterized as complacent and top-down, CORE urged the CTU to take action against school closings and “corporate education reform” generally. In 2010, the caucus took on a union leadership that had ruled nearly uninterrupted for four decades and won. Immediately, the union was restructured to become more democratic, making its members the central decision-makers. True to the caucus’s roots, the union joined forces with parents, community groups, students and other unions throughout the city to create a broad educational justice movement in the city. CORE’s history is not unique in the American labor movement. Unions are often portrayed as monoliths, but since the labor movement’s birth nearly two centuries ago, there have been arguments within unions themselves about their organizational priorities. Should unions focus their energies entirely on bettering the living conditions of their members? Or should they ally with broader causes on the left to simultaneously fight for their members and progressive change in society as a whole? That debate, between what education professor Lois Weiner, in her recent book The Future of Our Schools: Teachers Unions and Social Justice, characterizes as “business unionism,” concerned principally with bread-and-butter issues like compensation and led by paid staff on behalf of union members, versus “social movement unionism,” the kind of democratic teacher unionism that sees itself as part of a larger movement for justice, has been particularly prevalent in teachers unions since their birth around the turn of the twentieth century. In the 1930s and 1940s, the New York City teachers union, Local 5, pushed a broad democratic, progressive agenda in the city’s public schools against racism, overcrowding and underfunding before being barred by the city’s Board of Education during the Red Scare. The leadership that won collective bargaining rights for the union in the 1960s pursued a narrow agenda of improving compensation and teaching conditions, with a checkered record on civil rights. In the 1900s, the precursors to the CTU fought alongside parents to improve the miserable teaching and learning conditions in schools attended by immigrant children throughout Chicago, with teacher/community unionism remaining strong until mid-century, when the union took a conservative turn. Indeed, education reformers like Michelle Rhee and urban mayors like Rahm Emanuel have cultivated a caricature of teacher unions in order to disempower them. Teacher unions are the primary obstacle to what education activists have dubbed the “corporate reform” agenda; reformers have cast their plans as fighting for the best interests of students (Rhee’s lobbying organization, for example, is named “StudentsFirst”) while unions represent only teachers’ self-interests. While that narrative has proven durable nationally, in Chicago, the CTU’s broad movement-building has meant that most Chicagoans aren’t buying it. During the September strike, one poll showed more Chicagoans supporting the strike than opposing it; another showed a full two-thirds of Chicago Public Schools parents supported the union over Mayor Rahm Emanuel. That support hasn’t waned: in a Chicago Tribune poll earlier this month, three-quarters of CPS parents say they disapprove of Emanuel’s plans to close fifty-four neighborhood schools, and 41 percent of all Chicagoans said they side with the CTU in the education reform debate versus just 19 percent for Emanuel. Those numbers were likely impacted by the union’s framing of their strike and their overall union program as fighting for Chicago students, and by the provisions of their contract negotiated during the strike that the union says benefit both teachers and students. Since the CTU’s brand of social movement unionism gained national attention in the wake of the 2012 strike, similar caucuses have sprung up among teachers unions around the country. Teachers in Newark, New Jersey, formed the Newark Education Workers Caucus, taking inspiration from the CTU and CORE. Los Angeles teachers’ Progressive Educators for Action caucus won control of their union in 2005, only to be voted out a few years later; it has since worked closely with CORE members in recent months to push for a similar kind of unionism. In New York City, teachers formed the Movement for Rank-and-file Educators to take on the union’s incumbent leadership, losing April’s election by a large margin but laying groundwork for a future social justice push. The CTU will likely continue to serve as an example for such unionism. Fittingly, there was little time for union leadership to savor their re-election victory: just a few hours after the election results came in, the union was leading a three-day march to each of the fifty-four schools slated for closure throughout the city, culminating in a mass rally in downtown Chicago today at rush hour. Outside Bannecker Elementary, one of the schools slated for closure in the Englewood neighborhood on Chicago’s South Side, CTU President Karen Lewis told me she feels optimistic about the prospect of such unionism spreading. Last week, thousands of Philadelphia students walked out to protest severe budget cuts and school closings. Read James Cersonsky’s analysis.